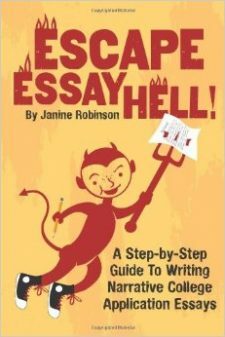 But what’s the real secret to nailing your essay? In my opinion, it needs to be personal. Personal means writing about things involving your private life, your relationships and emotion, thoughts and feelings, as opposed to only your public life and the things you do. In an essay, the more personal you get, the more you reveal your one-of-a-kind individuality—which sets you apart from the crowd. If you include all or many of the elements I just listed above, you will be well on your way to writing a personal essay. Share a flaw or phobia or weakness. Write about something only you care about. Be bold with how you feel and what you believe. Don’t worry about being judged. Be humble, even if you are pretty awesome. Actually, the more awesome you are, the more humble you need to be about it. Getting personal is risky business. It usually means you have to step out of your comfort zone, and that’s not easy. But this is how you connect with your reader. Would you want to read an essay that only talks about how great the person who wrote it was? Or one that listed all the impressive things they have done? Or someone who talks in generalities and only says what everyone else has to say? The people who are going to read your essay are admissions counselors, and they probably have fancy titles and are on a mission to find great students for their colleges, but above all they are people, just like you and me. The main difference between them and us is that they have to read hundreds of these essays, so that makes it harder to stand out and connect with them. The trick is to try to share something personal about yourself. Tell about something that happened to you (something on the bad end of the scale), or something about yourself that has been hard to deal with, or something in your background that has been a challenge. That’s what we all want to hear and read about: Problems. RELATED: Video tutorial on How to Answer Common App Prompt 4: What’s Your Problem? Of course, you don’t want your entire essay to only be about your flaws, and insecurities and self doubts, and for you to come across as a whiner or a loser. That’s not the point. But before you get to the good stuff about yourself, make sure to reveal some of your less-than-perfect side. That way, we will relate with you (we’ve all been there at some point and can feel your pain) and cheer you on as you tackle your issues and learn from them. If you don’t do that, we might get bored or feel jealous or annoyed by only hearing how great you are. And we probably won’t believe you anyway. One trick is to find some type of problem you have faced, and then go onto share how you dealt with it and what you learned. This Jumpstart Guide can help you get started.